Local professional landscaping, design and construction company in Greater Boston. 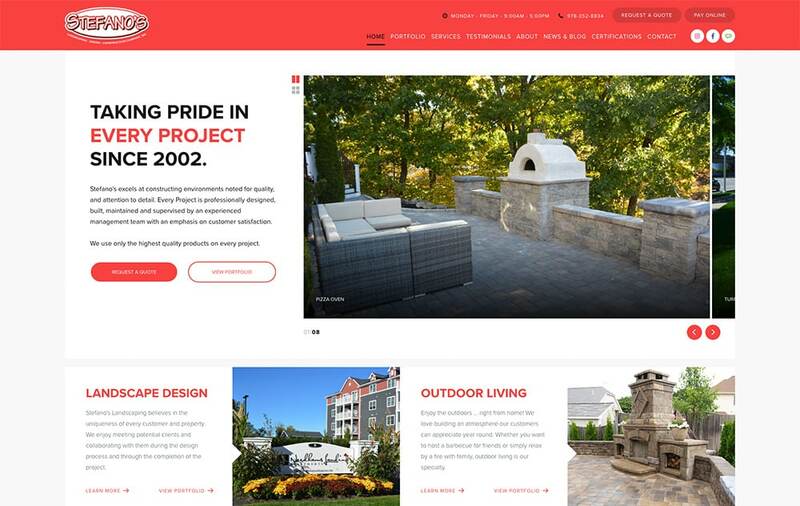 Stefano's Landscaping is a high quality, full-service landscape and construction company based in Saugas, MA. With a wide variety of services and ever expanding portfolio, Stefano's servers both residential and commercial properties throughout the Greater Boston Area and North Shore Massachusetts. The company is better business bureau certified and continues to grow since it's incorporation in 2006. 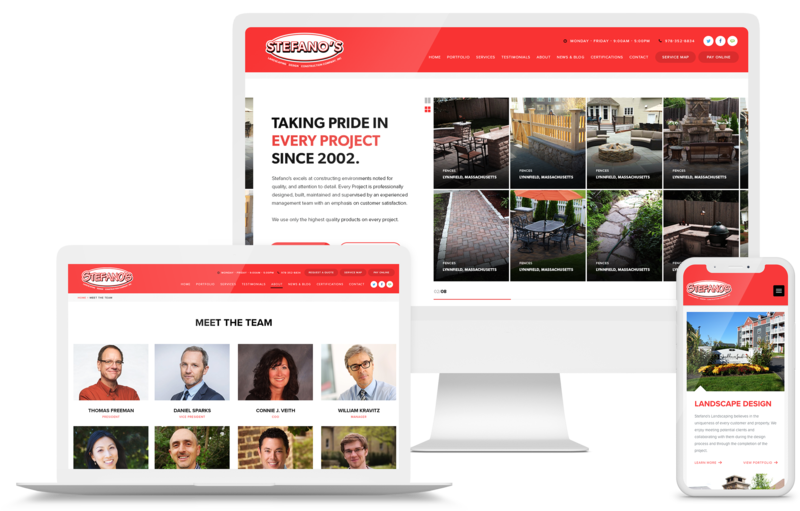 GoingClear Interactive was responsible for the design and development of the new Stefano's Landscaping website. We wanted to make sure the client's photography was on display first and foremost for this design since they have some many great, high resolution photos of their work. The site includes slideshows that work for both desktop and mobile across the site and allow the user too see the quality of Stefano's work from themselves quickly and easily. For consistency, we carried out the Stefano's red while also presenting the majority of content on white background the keep the design feeling clean an open. The site also has tons of back-end customizations so the client will have no trouble making future updates. 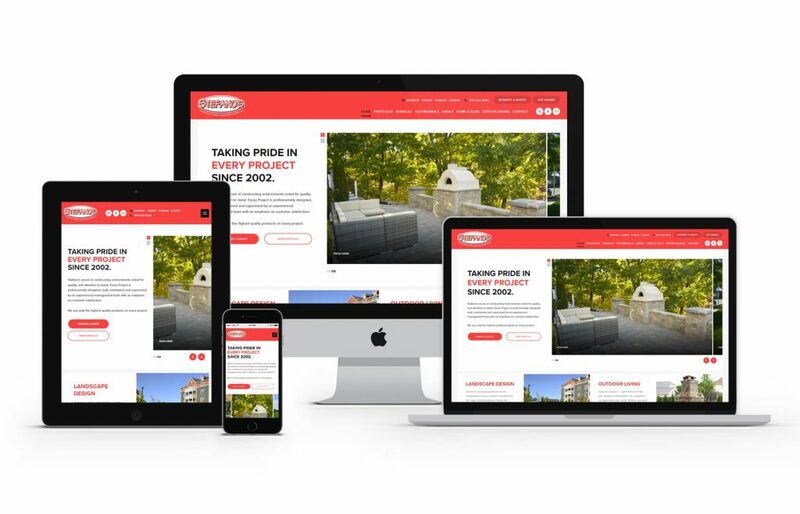 The new Stefano's Landscaping website was built using WordPress as the CMS (Content Management System) along with a fully mobile and tablet friendly design leveraging Twitter Bootstrap for the responsive framework so visitors will have a flawless experience on any device. Check it out for yourself!